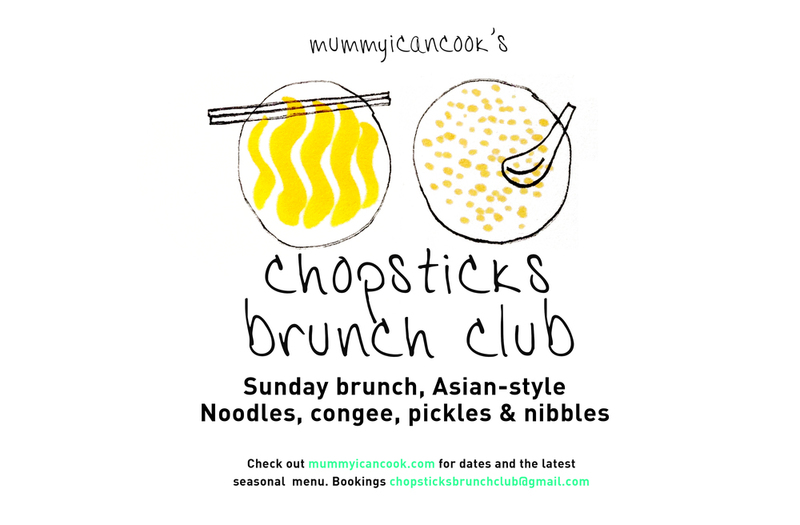 After years of supperclubs and popups at night, and going home in the wee hours of the day to a dirty kitchen, I thought it would be fun to start a brunch club. Brunch back home isn't quite so much about the poached eggs/ pancakes/ sausages and toast; there's noodle soups/ congee/ even curry. No forks and knives. The menu will change with whatever looks best this season, mostly sourced from Stoke Newington Farmers Market, or the amazing little independent grocers, fishmongers and butchers in the neighbourhood. Check out the latest menu, dates and bookings. In support of Action Against Hunger. PAST FUN STUFF: I've served a crazy 500 steamed buns with Yum Bun in a pop-up cocktail bar; flipped lamb satays over a barbecue at Street Feast in Dalston; flipped more things over a barbecue to rock & roll tunes; hosted fermentation workshops at a rooftop farm in Singapore; taken over vintage coffeeshop Carpenter and Cook with a toast party; and invaded a loft in Bushwick New York with rendang sliders.